EghtesadOnline: The Iranian rial continued its rally on Tuesday after weeks of depreciation had sent it to a series of record low. New gains for the national currency came unexpectedly as people rushed to exchange shops to convert their greenbacks into the local currency. 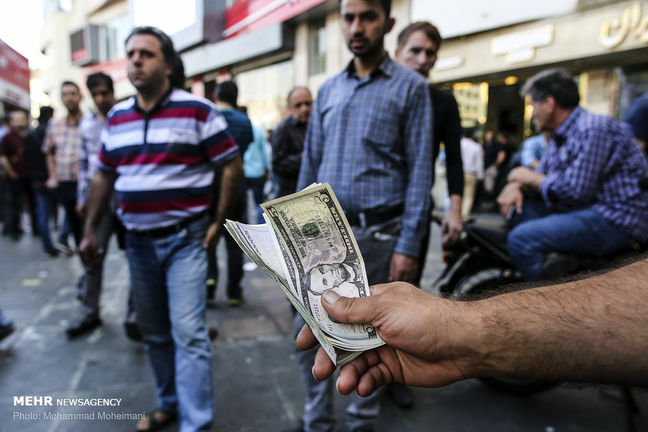 In Tehran, money exchange shops offered 135,000 rials for one US dollar in the afternoon but the rial was also traded as low as 100,000 rials to the dollar during the day. As different rates were quoted, exchange rate websites stopped showing the USD rate and exchange bureaux suspended trade. The day before, the rial was selling 170,000 to $1, with prices recently going as high as 190,000. The bearish trend for foreign currencies is attributed largely to the government bestowing more power to the central bank to intervene in the foreign exchange market to prop the rial, Financial Tribune reported. Optimism over Iran's cooperation with Europe to establish a mechanism for Iran to benefit from the 2015 nuclear deal after the US exit is said to have contributed to the trend. Others, however, point to the rial rally as temporary and driven by public excitement as later in the day, the exchange rate rose to 144,500 rials. The High Economic Coordination Council of the Heads of the Three Government Branches gave new powers to the central bank on Tuesday including the ability to issue rial and forex bonds and conduct open market operations. The CBI also communicated the details and conditions of the new mechanism announced earlier for meeting currency needs for non-commercial, everyday purposes to eleven agent banks through a directive, the bank’s website reported on Monday. The central bank noted that providing currency for medical purposes) for amounts above $10,000 (or equivalent in other currencies) with the Supreme Medical Council permit, there is no need for permits.